Cape Town has long been a destination on many travelers’ bucket lists. Named the best place in the world to visit by The New York Times and Telegraph in 2014 for its picturesque views of Table Mountain and Lions Head, Big-5 game parks within a few hours’ drive, and a peninsula peppered with semi-private beaches, it’s no wonder that it’s such a popular tourist destination. Beyond the sandy beaches and summer night braais (BBQs), there’s also a vibrant community of entrepreneurs and creatives who call Cape Town home. An increasing number of coworking spaces are cropping up to support this creative class and play a key role in positioning Cape Town as a contender for the title of Africa’s technology hub, currently held by Nairobi. Co-work·ing: The decision to work alongside others who may not be part of your immediate organization, typically in an environment that fosters innovation and collaboration. Coworking spaces offer their members a shared workspace for a daily, weekly, or monthly fee, often a temporary desk or private office, without the commitment of a long-term lease. Many spaces focus on building community, camaraderie, and a platform for networking that is more genuine and mutually beneficial than traditional networking events. Coworking has been trending for over a decade in metropolitan areas across Europe and North America due to high costs of leasing office space, rising entrepreneurship as an answer to high unemployment, and coworking’s position as a productive alternative to working from home or a café. However, Cape Town leasing rates are between 2 and 7 times lower than EU & NA metros (see table below), meaning that renting office space should be affordable for businesses that might otherwise host their employees in a coworking space. Moreover, Cape Town’s economy is built on larger BPOs, Financials, and Wine Exports rather than the smaller global businesses that coworking generally attracts. Despite these detractors to coworking, more than 20 spaces have sprung up in and around Cape Town since its first public coworking space opened in 2009. So why is coworking thriving in the Tavern of the Seas? This study looks at the top four technological and socioeconomic catalysts for coworking in Cape Town, and examines the key role that coworking spaces are playing in the growth of Cape Town’s ICT sector. Young Minds in 2008. Since then, over 20 spaces have sprung up in and around Cape Town. High commercial property rates are a common precursor to an increase of coworking spaces in a city. The supply of small to medium-sized office space is low and demand pushes the cost of ownership and even leasing beyond what local entrepreneurs and budding startups can afford. 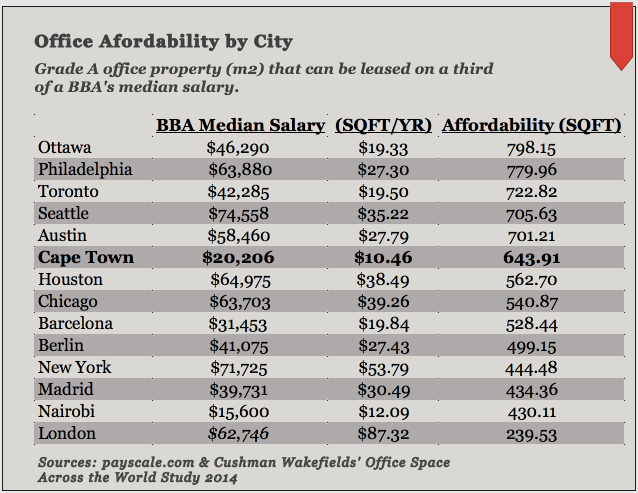 However, the cost per square foot of Grade A office space in Cape Town is currently $10.46/yr. Compare that to cities of similar size like Seattle or Berlin, $35.22/sqft/yr and $27.43/sqft/yr respectively, and you may come to the conclusion that rent prices in Cape Town are incredibly reasonable. You could attempt to normalize these rates using a consumer pricing index to get a measure of affordability, but costs vary dramatically across suburb and social-economic class. Instead, I asked how much space a Bachelors of Business Administration graduate (the BBA is a common degree held by entrepreneurs), could rent on a third of her salary, using the local median salary for BBA degree holders. As shown in the table “Office Affordability by City”, normalized leasing rates in Cape Town are higher than those in Seattle and Philadelphia, where coworking spaces are found at almost every corner. When we consider that leasing rates are incredibly expensive for the comparatively smaller salaries of BBA graduates in Cape Town, we know that coworking should skyrocket to accommodate frugal business owners. The current cost of leasing an office is often out of reach for many small business and independent workers, which forces the community to innovate and in this case, share the costs of rent and utilities via a coworking space. High Unemployment although not predictive of coworking in itself, can be a powerful stimulant to both startup and coworking growth when combined with increasing education. Jeff Bezos, CEO of Amazon.com, once said “frugality drives innovation, just like other constraints.” You may have observed this effect at the macro level in the United States during the Great Recession, which saw the largest increase in entrepreneurship of any period since 1996. (Kauffman Foundation) New business formation had been decreasing leading up the the recession in 2006, and began to increase between 2007 and 2008. It reached its peak in 2009, when the rate of new business creation was 17 percent higher than just three years before. South Africa and the Western Cape have suffered from persistent unemployment rates, reaching a 12 year high of 26.4% in May of 2015. This prolonged unemployment is having a similar effect on Cape Town’s ICT sector. Angel.co, a website tracking global startups, lists 208 startups currently in Cape Town positioning the city 3rd in Africa for most startups after Lagos (253 startups) and Nairobi (259 startups). A survey conducted in 2015 by Ventureburn on startups in South Africa noted that only 23% of these startups have leased their own office. Coworking spaces offer Cape Town startups a low-cost, low-commitment, and highly flexible space from which to launch. Increasing Education Levels: Tertiary education among Cape Town people aged 20+ rose from 12.8% to 16.6% between 2001 and 2011 and University of Cape Town is ranked #1 in Africa by QS World University Rankings. As education attainment in a city rises, its population becomes more employable by national and global companies, therefore skirting dependency on local companies, and allowing remote employees to work from home or from a coworking space. Beyond traditional education channels, Cape Town’s business community has made a concerted effort to incubate startups, which make up large proportions of coworking membership. Institutions such as Creative Cape Town (launched in 2006), the Silicon Cape Initiative (launched in 2007), and Daddy’s Dragons (launched in 2013) offer incubation and entrepreneurial support to budding businesses, and as far back as 2000 the Cape Innovation and Technology Initiative begun to support and facilitate the development of Cape Town’s ICT sector. In 2012, the Cape Town Creative Academy launched their campus in the city’s up and coming design district of Woodstock, offering courses in audiovisual, communications and interaction design, and in 2013 Springlab opened its doors to hear pitches from technology startups who want to take advantage of Springlab’s advisory services and execution support. These alternative education and apprentice programs arm local students and entrepreneurs with skillsets that easily plug into the globalized economy, where local demands and constraints are no longer a barrier to employment or scaling a business. As students find work and entrepreneurs find business outside their immediate city or country, they move from the offices of local employers to their home offices or better, a coworking space where likeminded individuals set up shop. Other cities looking to foster coworking growth and ICT business would do well to examine the incubation programs that cities like Cape Town have used to piggyback off of rising education levels. Access to Global Markets: It should come as no surprise that the first requirement of a modern coworking hub is high speed internet, which until recently has been a daunting hurdle for Cape Town, who is only now beginning to close the gap on internet access, let alone speed. Households with internet access in the Western Cape increased from 16.3% to 62.1% between 2007 and 2014. Cape Town is now poised to access a global market even if the local market falters. This was a direct line speed test, but it’s hard to be pessimistic about the future of coworking spaces in Cape Town. When we compare the Cape Town coworking scene to other regions across Africa, we find few that offer the complete package of startup space and entrepreneurship support programs. Nairobi, nicknamed the Silicon Savannah, has only 7 coworking spaces (0.21 per 100k inhabitants), verses 21 in Cape Town (0.56 per 100k inhabitants). Cities where coworking is thriving typically have 0.50 coworking spaces or more per 100k inhabitants. The number of incubation and accelerator services in Cape Town are also on the rise. Many of these operate out of a coworking space or host their own. The South African government has also begun piloting a new seed-funding program, partnering with universities and Technology Innovation Agency (TIA) to fund 50 startups with a collective R25 million. Most promising about this new program is the model they’ll use to disperse seed funds. The program is modeled after the Chilean economic development agency Corfo’s experience in managing Start-up Chile. The model promotes broad acceptance but tighter screening criteria to ensure startups have both a fair shot at acceptance and some skin in the game. The accelerator model is structured to deliver skills and guidance to help founders grow, instead of steering big ideas outside the realm of the founder’s original vision, as sometimes happens in incubation services reported in Zimbabwe and Nigeria. This mentorship approach may be an important departure from the norm for Africa and another step toward putting Cape Town and the South African ICT sector at the forefront of Africa’s technology growth.